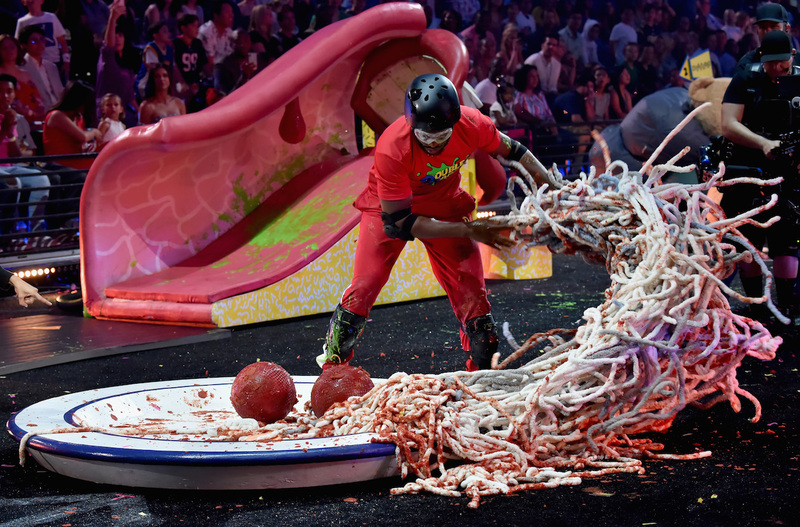 When kids and parents alike roar, and nine-time NBA All-Star Chris Paul slides into the scene and sends up a massive splash of green slime with confetti exploding all around, you know it is time for the fifth annual Nickelodeon Kids’ Choice Sports awards. The show, which taped on Thursday, airs Friday, July 20, at 8 p.m. ET on Nick. He was right. Moments after Patrick held her blimp, canons rose up and fired gold slime from just feet away, leaving her looking like a gold statuette herself. Phelps was not just at the show to provide support, though; he had to compete in a head-to-head event against the host, Houston Rockets point guard Chris Paul. To promote the return of the Nickelodeon show Double Dare, Paul and Phelps squeezed through bubble rollers, kicked through spaghetti sauce–covered balls, and fished in slime-filled toilets—all for bragging rights. It was Paul’s night. But this is a show for kids, and kids lit up the evening. One had a chance to sink a half-court shot and win $50,000 (narrowly missed), and there was a “slime dunk” challenge in which kids could make baskets to dunk their pro athlete teammate in a tank of slime. (Both pros, Candace Parker of the L.A. Sparks and Isaiah Thomas of the Denver Nuggets, went down.) Kids starred in every part of show, from appearing in live backdrops whenever a winner was announced, to dancing in between set changes. Setting the stage for an inspirational evening early, many athletes and celebrities spoke about their careers on Nickelodeon’s orange carpet before the show. “My swag on the field is myself—being myself,” said Kansas City Chiefs tight end Travis Kelce when talking about the night’s King of Swag award and how he brings swag to the field. “Always be yourself,” he added, echoing the night’s motivational message. 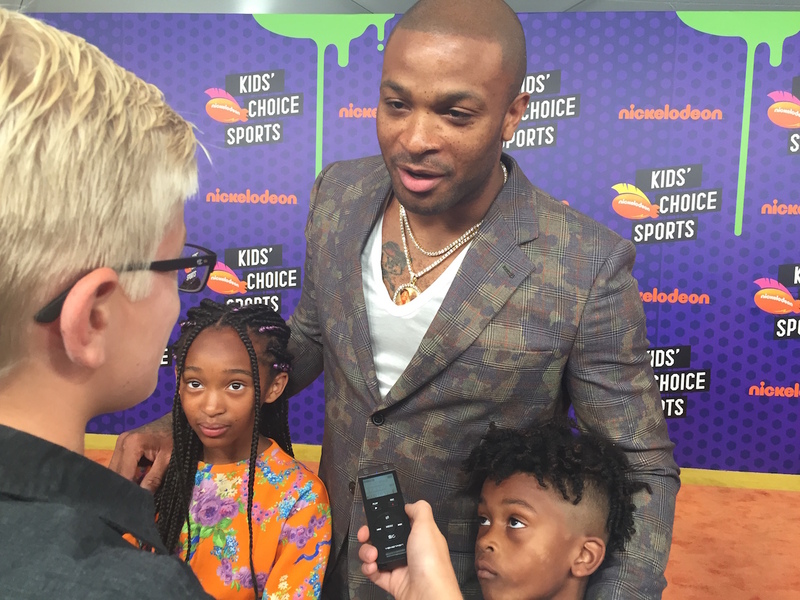 Nickelodeon Kids’ Choice Sports 2018 highlighted athletes but featured, promoted, rewarded, and starred kids. Athlete after athlete walked the carpet and enjoyed the show with their children. With his arms around his young daughter and son, Rockets small forward P.J. Tucker turned and smiled as he walked into the awards show. “I surprised my kids by bringing them today,” he said. “Hey, it’s an event that combines slime and sports.” Perfect. King of Swag: Odell Beckham Jr.